Here we see a mixed-techniques lithograph by the Spanish artist Salvador Dali, whom is most of all known to us through his surrealistic work. Dali, however, had a good friend in Dr. Giuseppe Albaretto, a devout Catholic. He commissioned Dali to illustrate the Bible, so that he would have to study it and perhaps return to God, with the Biblia Sacra with its 105 outstanding lithographs (1964-1967) as result. The lithograph above carries the title Beati pauperes, beati mites, beati, Psalm 1:1, or ‘Blessed are the poor, blessed the meek, blessed, Psalm 1:1’. 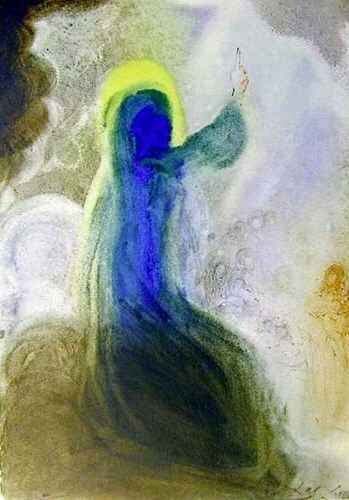 With this title Dali makes a connection between Psalm 1 and the Sermon on the Mount. This means that the figure in the lithograph can be Moses or Jesus, as both of these men emphasize that our love of God should be all exceeding.